Every few years I get nominated to serve on the Gray Family Reunion committee. I don’t think it’s as much my good looks or superior intelligence that attracts voters as much as my willingness to serve my greater family and preserve the centuries-old Scottish tradition called “The Gathering of the Clan.” [See “Table of Contents: Gray” for background on our notable family.] As I was growing up in the 1950s and 60s, I remember extravagant picnics with barbequed chicken or hamburgers and hot dogs cooked over flaming embers while we youngsters stood around waiting to be served. The get together was always held near a swimming pool so we could cool off with our cousins in the hot summer sun. Back then, if I recall, a controversy “brewed” as to whether the committee should provide beer along with soda and Lemon Blend. More recently, the only controversy has been how much to spend on a pavilion to shelter the dwindling number of attendees. While we try to have representation on the reunion committee from each of the four families produced by Great-grandparents Robert and Annie [see “The Descendants of Robert & Annie Gray”], each year it seems to get more and more difficult to find volunteers. But, this year my brother Carl and I will be part of a small group of leaders who try to continue this family tradition for at least several more years, until we reach the golden anniversary in 2004. As I prepared to write this article, I was immediately drawn to the big cardboard box of reunion supplies – paper plates, aluminum foil, styrofoam cups, etc. – which becomes the proud possession of one of each year’s secretary. On top lay a small black three-ring notebook filled with minutes of the business meetings held after each year’s evening meal with reports of weather conditions, attendance, activities, and next year’s committee people. What follows, then, are a few highlights of a few of those many meetings. As you read them, you may have memories of your own and be willing to share them with the rest of the family. You may do so by contacting me: Larry Pearce [pearce@atlanticbb.net]. Both Bertha Grays [my grandmother, Bertha Ione, A.K.A. Bertha Paul for my grandfather, and Great Aunt Bertha Bonin, A.K.A. Bertha Will for her husband William] tied for most immediate family members present. Jim Ferguson won the chest expansion contest. Anne Ferguson and Anne Harnish tied in the smallest waist contest. The 1956 reunion minutes end with the announcement of a committee meeting for the following month, a list of both the present and the new committee persons, and their phone numbers. The Third Gray Reunion was held at a new location, the new Zelienople Community Park just off Route 19 in Butler County. The venue only cost $10 to reserve. Several other changes were authorized by the committee, including serving ice cream and popsicles and moving the meal time up to 4:30. Some complained that there hadn’t been enough orange “pop” or any lemonade at the last picnic, so they were provided, but the real concern was that the new pavilion be able to accommodate a full buffet, as the North Park shelter left some folks out in the rain. Everyone seemed happy with the arrangements. The family activities that year included volleyball, horseshoes, tug-o-war, sack races, and bingo. The real treats were swimming in the new pool and Ben Ziegler’s home movies after dark, which had been taken at the first reunion in 1955. A total of 82 people were in attendance, 77 family and 5 guests, making it the largest yet. It was a “Gray day,” so to speak, since the weather was overcast with heavy clouds, and it looked as though rain would fall at any moment. This, however, proved untrue, so the day was a successful one. There was a great deal of food left over, which was sold. This was due to many people not eating as much as usual. What’s the matter? Everyone on a diet????? I know one Aunt Elma who sampled every bit of food there, especially the assortment of five desserts. She’s no piker. After chasing all the big industrial and financial moguls out of the park, who wanted to use the shelter we had reserved, the Gray Reunion got off to a happy start. Though the treasury was solvent, the Grays decided to go back to a format of the old family-style picnic. Also, some in the crowd wanted to move the get together to another park, so in 1962 it was returned to North Park, but this time the McCandless Grove, right at the entrance to the swimming pool. A little rain and a lot of wind kept the attendance low that year. The 1963 minutes are missing, but the 10th anniversary reunion in1964 was held at North Park’s Paddock Grove, high atop the hill near the horse stables and the golf course. In true Gray fashion, someone complained about the location. We’re not sure if it was the air quality or the distance from the swimming pool. Another complained that there wasn’t enough lemonade. In 1965 the gathering was moved to the beautiful Ontario Grove, down along the shore of the lake in North Park, and a professional photographer was hired to take an official family portrait for the first time. That practice has been repeated many times since. A new game was introduced that year where people had to guess the subjects of old pictures. The 63 in attendance enjoyed that. In another first, the clan elected all young people to plan the 1966 reunion, including me, a senior in high school. So, at the committee meeting, chairman and cousin Bob Gray persuaded us to hold the next picnic directly across from the North Park swimming pool as a convenience for families with children. In another first, my cousin Tom Gray and I decided to make home made ice cream that afternoon. Along with the usual games, prizes were awarded for the tallest and shortest man and woman, the baldest man, and the longest haired boy and girl. The official attendance was 72, which seemed to please the crowd, so they reelected the young committee for 1967. The venue changed to several new locations in North Park over the following years. By 1969 the committee decided to hold a White Elephant exchange. People brought unusual wrapped objects and exchanged them. Several notable suggestions from the minutes that year include getting a grove with electricity that is closer to the restroom facilities and “devising some means by which the ‘youngsters’ can communicate with the ‘oldsters’ and vice versa.” The generation gap has always been a problem, so the Grays sought to solve it. In 1971 the first raffle was held at which several hams were awarded. This raised $21.50 but the cost of the hams was $11.98. In 1972 a turkey and a ceramic piece were raffled. That was the year that the Gray reunion moved to Butler’s Alameda Park. The picnic was to return there the following year but a great rain storm flooded the Akela Grove and the reunion was postponed to September 1st at another grove. The reunion continued at Alameda in Butler through the 25th anniversary in 1979. The average attendance over the years remained between 60 and 70 people. As the years went by, many of the older folks could no longer attend. That year Roberta Welsh brought a tape recorder to capture messages for the elderly Aunt Janet Kellar. I remember one year, my Uncle Merle, who thought he was young and invincible, broke his leg in the annual softball game. Everyone “pitched” in to carry him to a car for transport to the hospital. The real heroes in 1980 were my Grandmother Bertha [A.K.A. Paul] and Great-aunt Bertha [A.K.A. Will], both in attendance while in their late 80s and early 90s. Unfortunately, Grandma became ill that day, and that was her last public outing before her death that fall. I remember that a severe electrical storm forced everyone home early that year. The park had more flooding problems later that year, and with the threat of the bridge to our grove washing out, the committee decided to move the reunion up the road to Butler Memorial Park in 1981. In a sense, the Gray Reunion “came home” in 1982 when it was held in the municipal park not far from the original Gray homestead near Bairdford, Allegheny County. Bertha [Will] was there at age 93. One of the earlier traditions was resumed, the on-site chicken barbeque, but another took on an intergenerational flavor, the annual softball game. That became so popular that it was difficult to get people to remain in the pavilion after dinner for the business meeting. Attendance seemed to waiver in the coming years. Only 43 were there in 1984. A new dinner seating plan was inaugurated. Numbers were drawn by the adults, and those with matches had to eat together. As usual the comments later at the business meeting were worth the wait. Merle Gray reported that he “sat beside Clara and didn’t even get indigestion.” Ralph Pearce assured everyone that they didn’t have to go home with their partner from dinner. In 1986 Great aunt Bertha [Will] attended at the age of 97, just a month from her 98th birthday, but that was the last year she was able to be there. In ’88 the number of Grays participating jumped to 58, but with the numbers declining on average and the cost of the Bairdford pavilion increasing each year, the committee decided to change the venue yet again. The beautiful Deer Lakes Park near Russellton, Allegheny County, was the scene of the1993 reunion. Some complained about the distance of the shelter from the parking area and other inconveniences, so it was moved back to Bairdford. In 1996 and ‘97 the picnic was held at Connoquenessing Boro Park, Butler County. By now the understanding was that whomever chaired the committee could hold the picnic wherever they wanted, but most of the picnics have been at Bairdford Park, probably because of its proximity to the original Gray homestead. 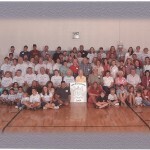 In 1998 the pre-reunion committee meeting took the form of what was called “The Senior Gray Gathering of the Cousins.” The meeting was recorded and tapes were sent to each family. [For a transcript, click on the link above.] The reunion itself, the 44th annual, was held August 2nd at the Bairdford Park with 66 in attendance. The water service had been shut off so some of the committee had to return home to get enough liquid to make punch and coffee. But the children discovered water in the restrooms and filled balloons for throwing. The warm afternoon was capped off with a delicious potluck supper, games for the kids, and softball for the young adults. The following year, Bob and Bonnie Gray were gracious in having everyone at their farm near Renfrew, Butler County. The clan enjoyed the horses, pony rides, and a petting zoo, but the weather was unseasonably cold that year, and the committee had to scramble to get enough coats and jackets for everyone to wear. 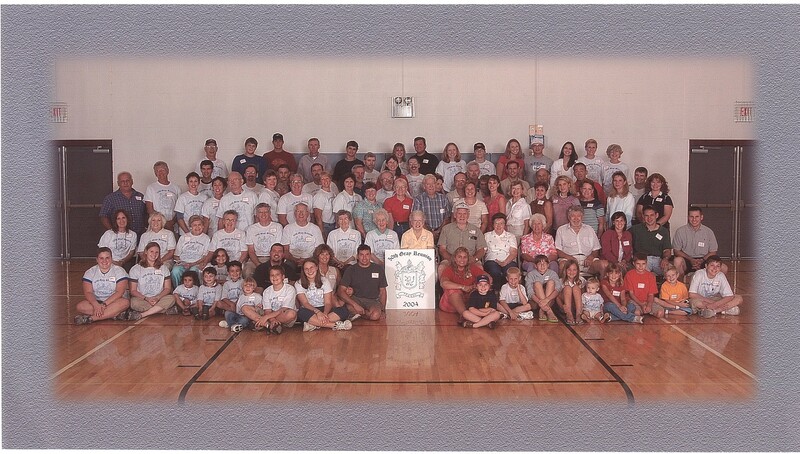 For the years 2000 through 2002, the annual Gray reunion was held again at Bairdford Park in West Deer Township with attendance each year around 60 people. The first year the weather was chilly, but last year the temperature soared to the mid-90’s. The children were kept cool and entertained with water balloons, sponge tag, and a variety of squirt guns. There was little horseshoe pitching and softball in 2002 because of the extreme heat. The oldest in attendance was Ruth Pearce at 85 and the youngest were her twin great-grandsons, Garrett and Ryan, each two years old, Ken and Niki Pearce’s children. The committee has arranged to have this year’s 49th annual picnic at yet another location, Adam’s Township Park near Mars, Butler County. The brand new facility promises better restrooms, running water, trees, and grass—all at a lower price. Despite its reputation as complainers, the Gray family has always welcomed new ideas and supported the choices made by their reunion committee over the years. One of the ideas generated by the present committee that will be explored in the future is an early afternoon tour of our original Gray farm and several family cemeteries. Many of the younger generation are not familiar with these sites. In closing, I’m certain that we haven’t captured all the good stories from almost 50 years of Gray Reunions, but at least we’ve begun to record, summarize, and preserve a few of these many memories. As the Golden Anniversary of our clan picnic is planned for 2004, perhaps we can call on the older folks to recall other important happenings related to our large family. This is the time to share the narrative wealth that over eight generations of Grays have produced in America. Whether the Robert Patterson and Annie Sims [Norris] Gray reunion continues beyond 2004 will be up to the descendants, but one thing is for certain: As with the ancient Scottish tradition, regular clan gatherings strengthen and unite any county’s most valuable resource, the family.